. Knit So Simple: It's a beautiful day in the neighborhood. . . . I have a new word for you - have you ever heard of Mercerized Cotton? Mercerized cotton is a special kind of cotton yarn that is more lustrous than the common "Peaches and Creme" variety we typically use for washcloths. It is also stronger, dyes easier, and makes the yarn more resistant to mildew and reduces lint and all those annoying little pill bumps that often pop up after all your hard work! 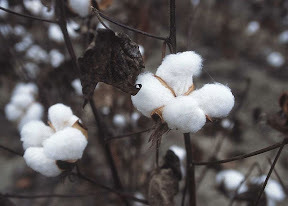 It also may not shrink or lose its shape as much as "regular" cotton. I stopped off at Hobby Lobby on the way home yesterday to find something for the Feather and Fan baby bib and found what i think (hope) will be the perfect choice for this sweet thing. I knew I wanted cotton so it would be absorbent for spills and other 'baby' things, but i also wanted something that was a bit more delicate in appearance - and most cotton yarns are knit with a larger needle and would result in a bulkier bib. 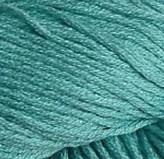 HowEVER, I found this simple skein of Sinfonia brand mercerized cotton, with a needle recommendation of a size 4! Perfect! It was only $4.99 and I used my mobile/digital version of their 40% off coupon, so for $3.26 I ran home and started working on the bib I have in my mind. This cotton is very crisp and showing the detail of the stitches quite well! But now I am intrigued just as to what "mercerized" means! Mercer discovered that by adding caustic soda (lye) or sulfuric acid to cotton it made the fiber swell and straighten. No one was very impressed by his new 'observation', but in 1890 Horace Lowe developed a process by which caustic soda was added to the yarn under high tension, which added the luster that mercerized cotton is famous for today. 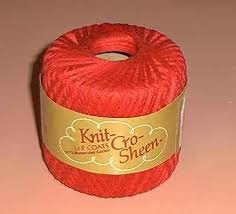 Mercerized yarn stays shiny through washing (perfect that those baby bibs .. and what about some sweet booties now too!) and gives a nice, somewhat "fancier" look to finished items, which is exactly what I was hoping for with this bib. As I was reading about this "process" I couldn't help but wonder if My own life reflected such "mercerization" ? All the pressures that I so would like to avoid... The potholes and detours in my plans, the pressures of choices in my replies and responses to others, the empty moments that I think should be filled .... All of these things basically are designed and orchestrated by my Master Spinner who longs to make me stronger.. Reflect Him more radiantly and confidently .... All while having the endurance to persevere and continue through anything that may come my way. Kind of like a modern day Energizer Bunny... I just keep going and going, resting in the promises of Christ, my Savior! And shining like Mercerized Cotton! Washed in the Blood of the Lamb .... and forgiven so that i am White as Snow! well, that makes it Shiny!!! But I rest in You, O God; I say "You are my God". My times are in Your hands!